When you become a member of the ACUIA, you will have access to all of the following member benefits. Click here to join today! ACUIA is registered with the National Association of State Boards of Accountancy (NASBA) as a sponsor of continuing professional education on the National Registry of CPE Sponsors. Most, if not all, of the programs offered by ACUIA provide a forum for CPE credits. Please check the specific program to confirm the approval of credits. The Annual Conference & One-Day Seminar is the most beneficial professional development activity offered by ACUIA. The conference features speakers presenting topics relevant to the profession, and is also an ideal opportunity to network with others in the field. Click here for more information. ACUIA members receive a substantial discount on the conference registration fees. ACUIA offers regional and chapter meetings for members to congregate and discuss issues that are pertinent to their locale. These provide great networking opportunities for you to discuss regional examination processes, share audit programs, discuss how economic conditions in your area are affecting your credit union, etc. Check the Events Calendar often for upcoming meeting information. 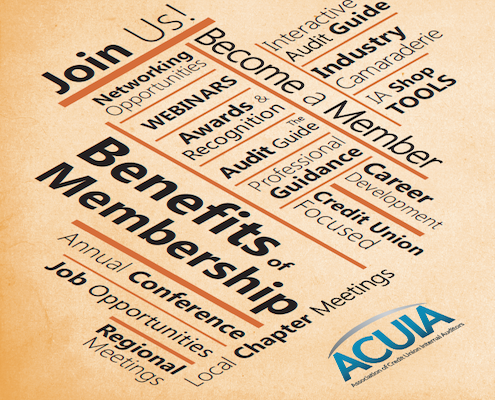 ACUIA members receive a discount on meeting registration fees. Complimentary webinars are a benefit of your ACUIA membership! 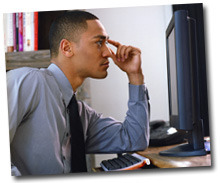 Held throughout the year, webinars are a terrific way to stay informed while in the comfort of your home or office. Fellow ACUIA members and industry experts provide members with valuable, current information to enhance the industry. Log into the Members Only section of the website to view and register for webinar offerings. ACUIA publishes an online copy of The Audit Report online magazine featuring articles of interest to those in the profession. Click here to view a sample issue of The Audit Report. Log into the Members Only section of the website to obtain access to current and past issues of The Audit Report magazine. According to Standard 1300 of the International Standards for the Professional Practice of Internal Auditing, a chief audit executive (CAE) should develop and maintain a quality assurance and improvement program that covers all aspects of the internal audit activity and continuously monitor its effectiveness. With permission from the Institute of Internal Auditors (IIA), the ACUIA has developed QAR process checklists to assist credit union internal audit departments in complying with these Standards. Log into the Members Only section of the website to access the QAR resources. The ACUIA Interactive Audit Guide includes administrative procedures and internal audit programs created by your credit union peers. The audit programs include audit steps/procedures and questionnaires and cover topics common to many credit unions. If you are a new auditor just getting started, this is a great way to begin that audit plan. For more seasoned auditors, the audit programs are a great supplement to your own audits. Log into the Members Only section of the website to access the Interactive Audit Guide. ACUIA relies on member volunteers to work with the ACUIA Executive Office to meet our membership’s needs by assisting in organizational strategic planning, coordinating educational offerings, maintaining adequate member resources, and promoting the growth of the association. Log into the Members Only section of the website to view more information on volunteer opportunities. 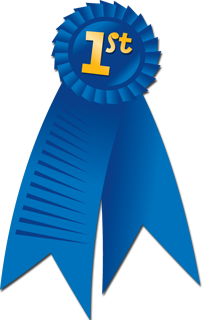 To learn more about these awards or to submit a nomination, click here. Nominations must be received by April 30 to be eligible at this year's Annual Conference & One-Day Seminar. This is a list of all resources sorted by Resource Type and Title.